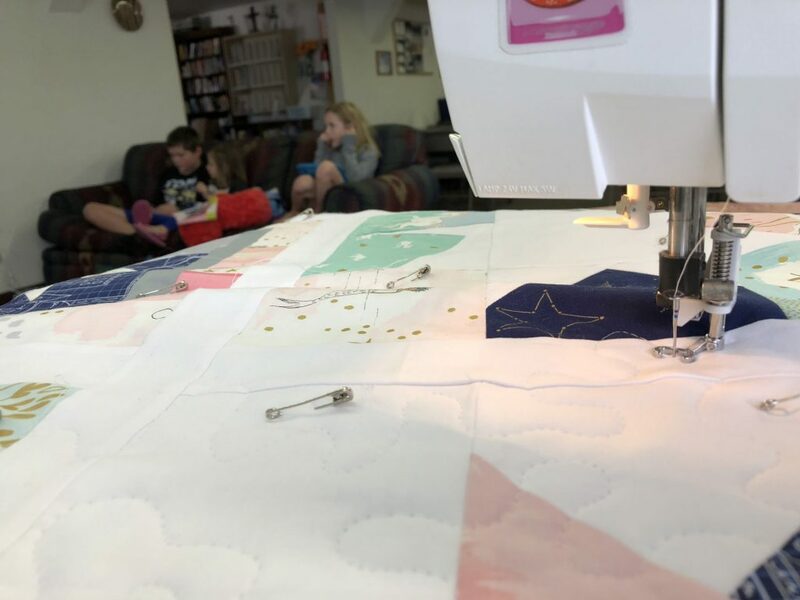 while we were in benson, i was able to get a TON of sewing done. 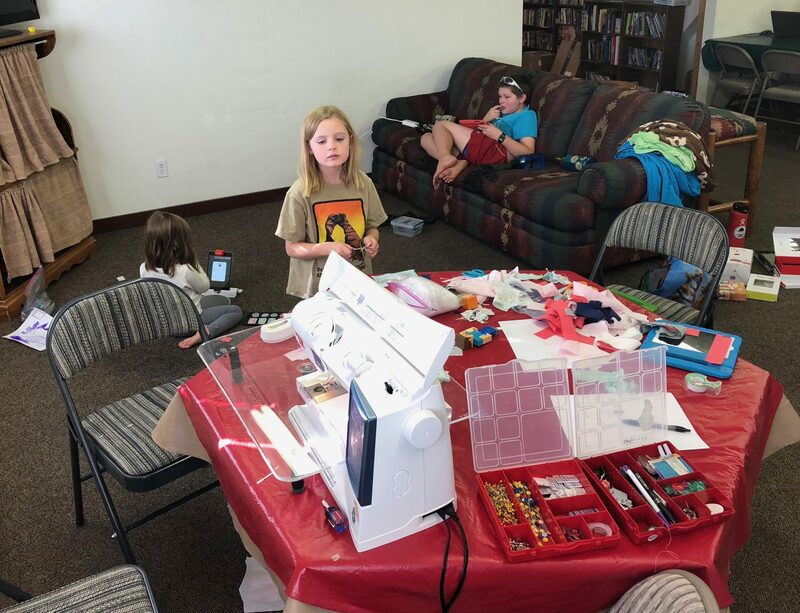 the staff and volunteers (and other campers) were great about all of us descending upon the rec lodge and taking over, so i could set up a quilting factory, and the kids could rot their little brains out. we came equipped with ipads, isaac’s nintendo 2ds, art supplies, and kindles. we also took over the tv to watch a bit of paw patrol when there weren’t any older folks watching fox news. i was a little rusty at first, so my first two stars weren’t up to standard, but worked nicely in the backing. plus i got to use some of the big border prints that didn’t seem to work as well in the little stars. i enlisted isaac to get a natural lighting shot. :). 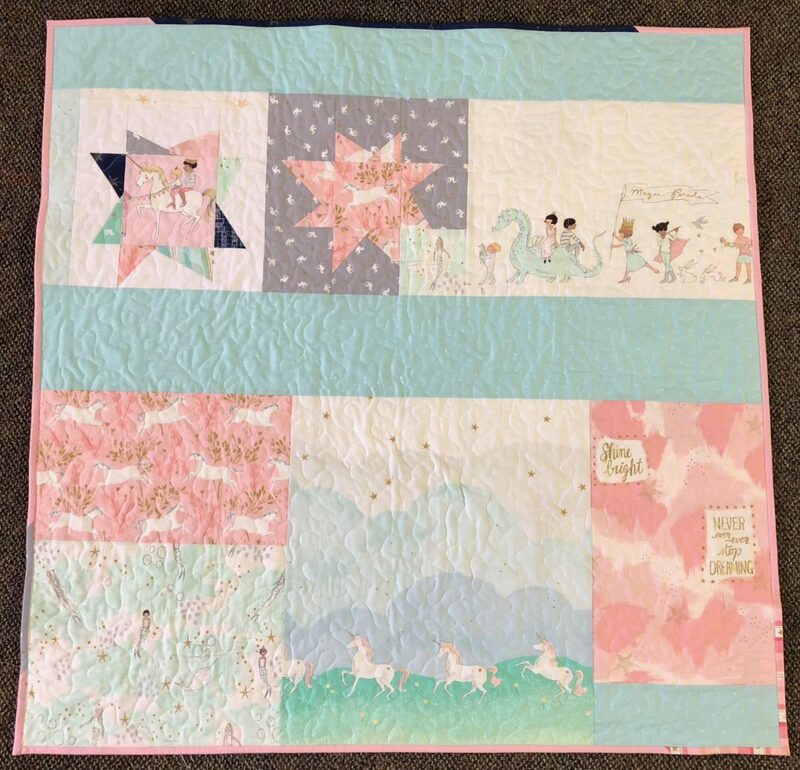 for the previous quilts that i’ve made for the boys (here and here) in the fam, i made a scrappy wonky star quilt of my own creation, so i went with the same idea for this one. 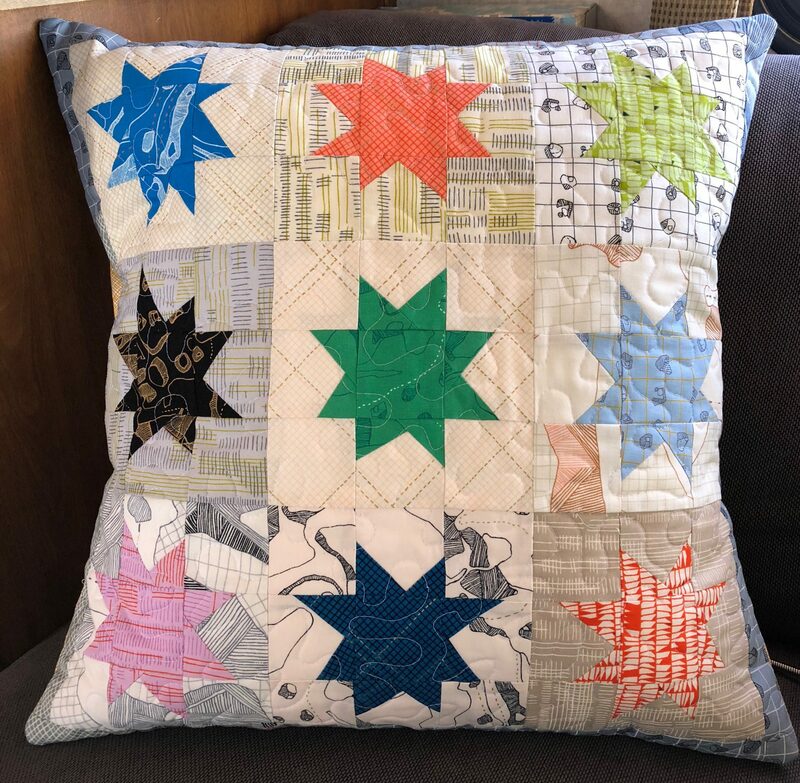 i quilted it with an all over meander, my total go-to for fast finishes. 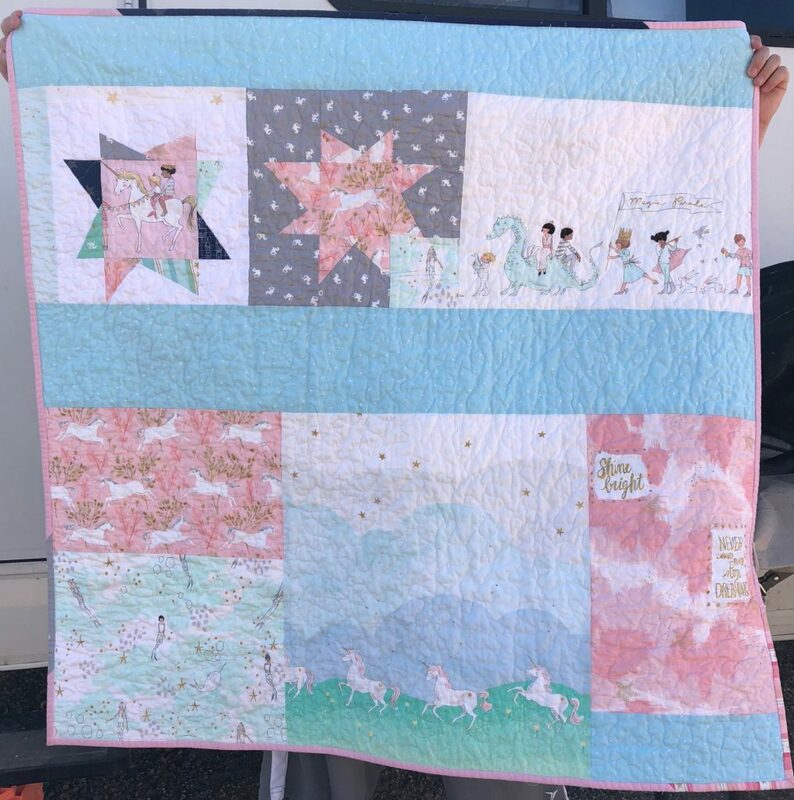 and the solid pink binding was all i could get my hands on at hobby lobby in tucson in a quick trip before we went to saguaro national park one night. i mixed in some other bits to keep with the scrappy theme. 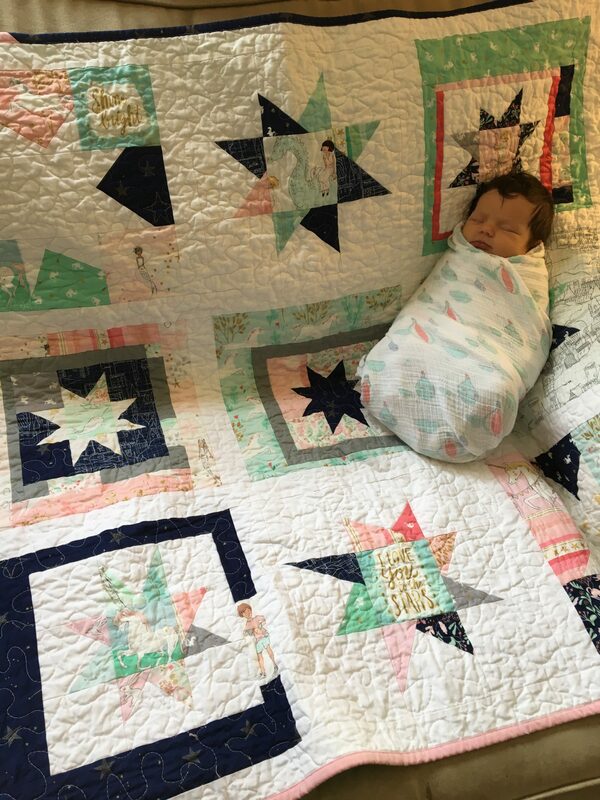 she also sent along this little burrito bundle pic of reya on her new quilt. so sweet. so. that was fun. 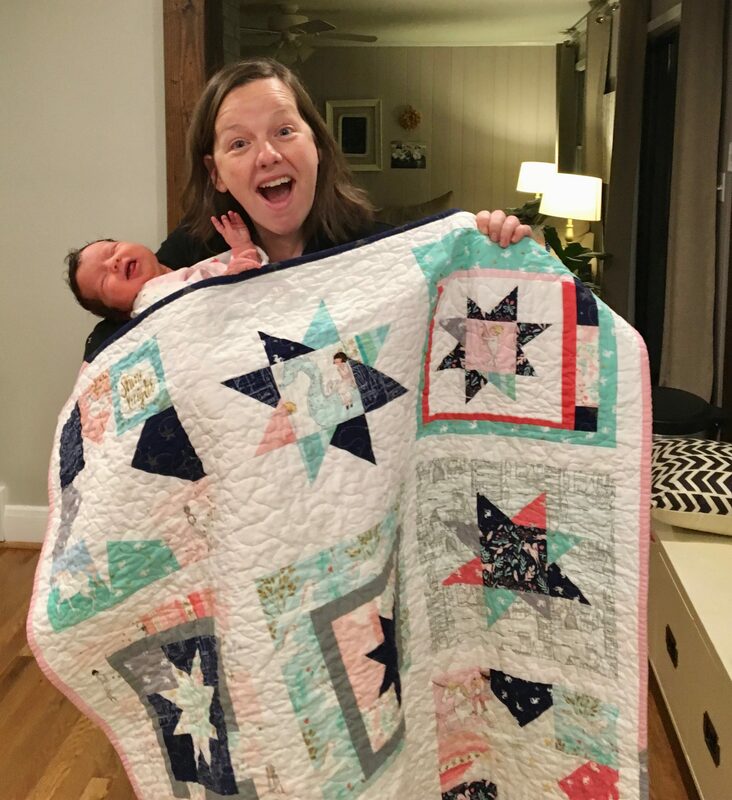 maybe one of these days i can make one for her first kiddo, who was born before i was a quilter. we had an extra week in benson, because of some hot water heater troubles. 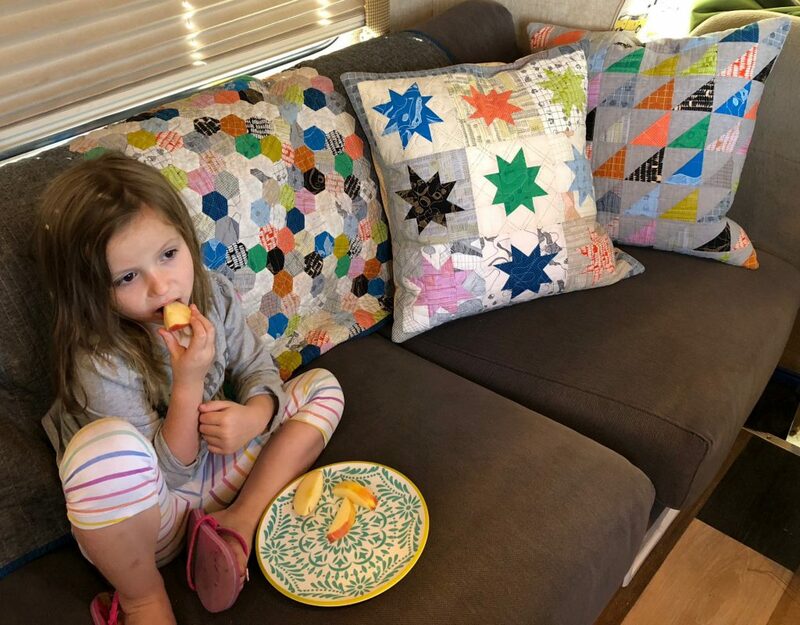 which also gave me enough time to FINALLY make some pillow covers for the camper. i have christmas covers for the pillow forms, but for the rest of the year, i have nothing, so i either donate the forms or carry them around with us. 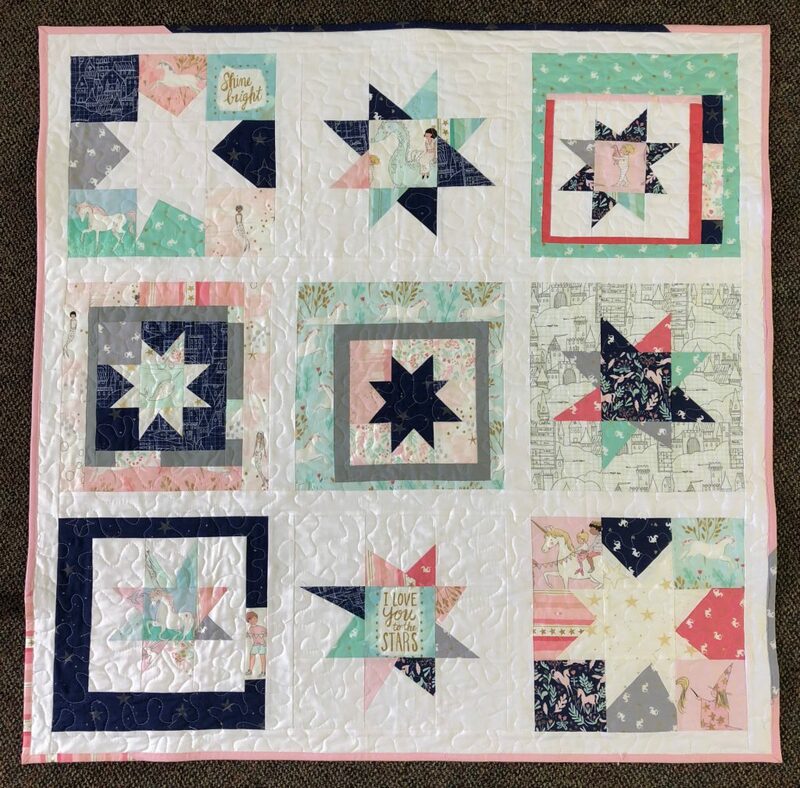 i had leftover scraps from my FAVORITE carkai hexie road show quilt. plus a bit of yarn dyed linen in different neutral shades. 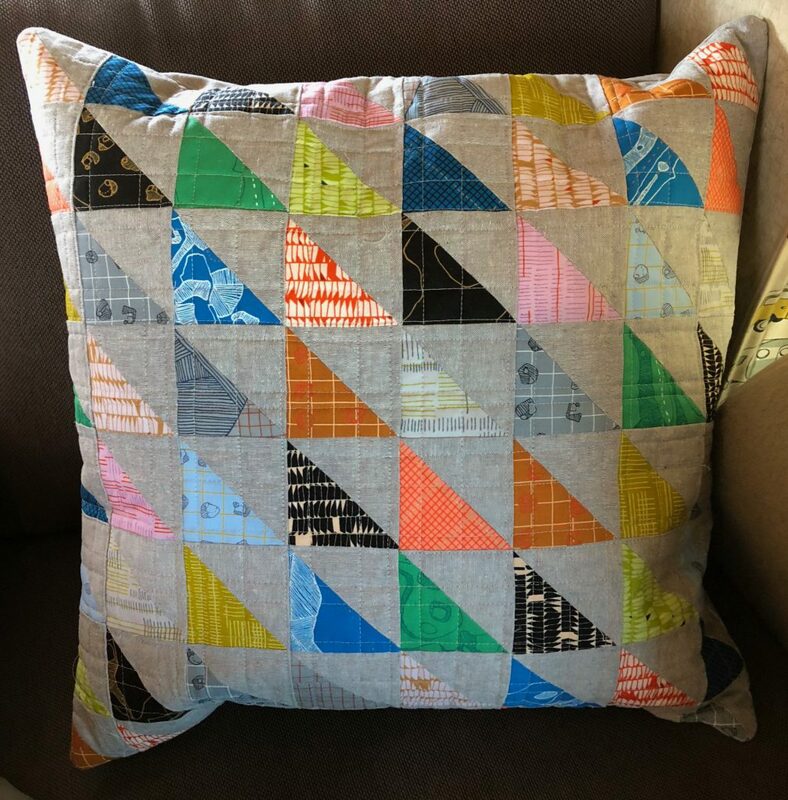 i went with half square triangles for the first pillow. 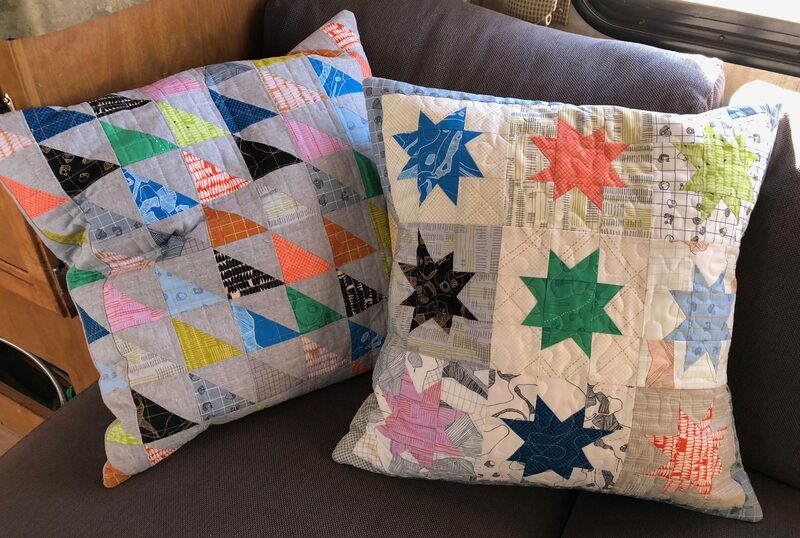 and then, of course, wonky stars, which are pretty much my favorite, for the final pillow. i used the low volume fabrics from carkai for the backgrounds and i love the way this one turned out. 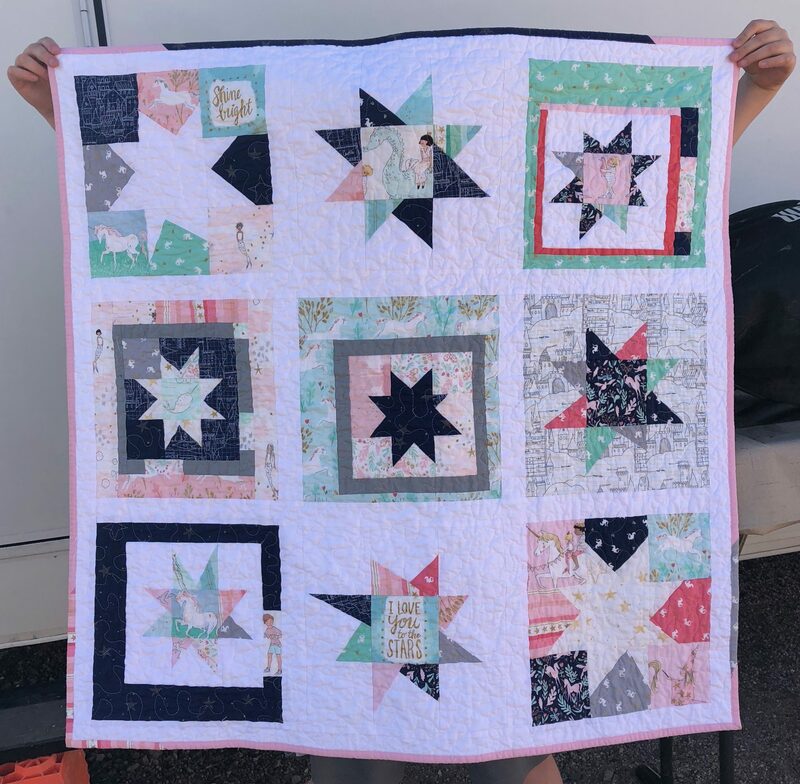 then, i busted out my hexie quilt and took a giant family photo. i still have a ton of carkai fabric leftover, but i’m feeling like after two years of sewing with it, it’s time to move on to a new fabric bundle. finally, our time in benson was over. i packed up my quilty stuff carefully, and if history tells me anything, it will be 4-6 months before my next sewing adventures. Beautiful quilt and pillows! I love the bundles baby on the quilt pic.